Announcing the Third Doris Day Blogathon! That being said, I couldn't neglect to do one of my favorite events: my annual Doris Day blogathon! The idea of not celebrating this woman who is so close to my heart was unthinkable, so I looked over my calendar, made sure I could handle placing the event on Ms. Day's April 3rd birthday, and quickly cobbled together some banners, which I'll admit are not my best work. You can write about anything relating to Day -- her films, her music, her personal life, her work with animals, her role as a style icon, the list goes on! I also won't limit how many posts you want to do. Because there is so, so much you can write about, I'd prefer no duplicates. Sorry, all, it's first come, first serve. 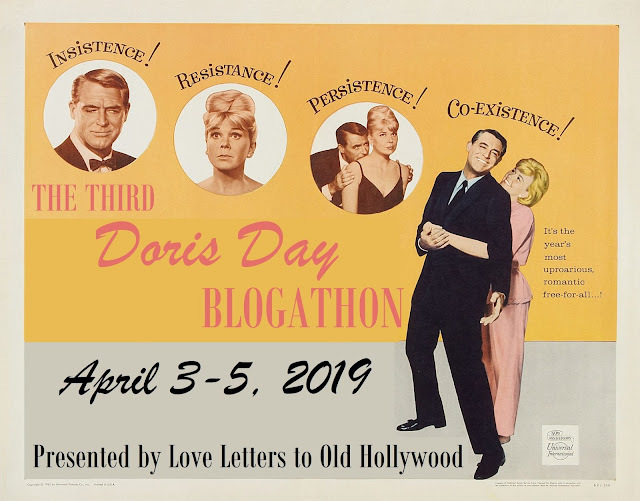 You can post on any of the three days of the blogathon, or you can post early! I only ask that you be sure to send me your link and I'll try to post it as soon as possible. Now grab a banner, spread the word, and I'll see you in April! P.S. 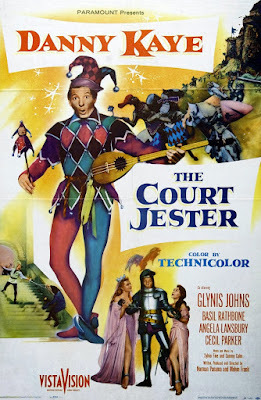 Just to give you a sneak peek of my summer ideas -- I'm planning on bringing back my Clark Gable and Van Johnson blogathons, so keep your eyes peeled in the next few months! I want to do "Pillow Talk", because I couldn't complete my post on it for the Rock Hudson Blogathon. Can't resist Doris. Sign me up for The Winning Team, please. You got it! Glad to have you, Paddy! 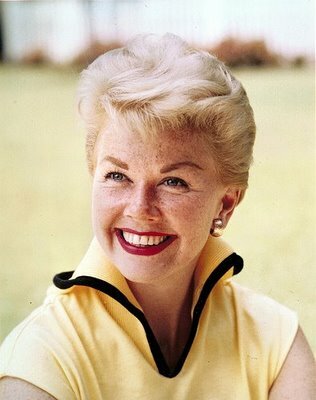 I love Doris Day! Can I please take "Romance on the High Seas" (1948)? Love that movie! Thanks for joining! Hi, Michaela! I'd like to do "The Pajama Game," please. That's one of my absolute favorites! Thanks for joining! Glad you can finally join us! And I understand. There have been certain blogathons that I wish I could join because I like the person hosting, but I just don't have a topic that works. Can't win 'em all, I guess! Can I claim It Happened to Jane? Certainly! Glad to have you! My post is now live! Great, happy to have you join us! Thanks, these are fab banners! Thank you! They're not my favorite work, but I was pressed for time. Been talking with The Poppity from Poppity Talks Classic Film via Social Media, she's had problems getting a message to you and would like to join with Young at Heart. Can you add her. Hello! I would love to write about 'Young at Heart'. �� I'll let you know if I wish to take on a second film. You got it! And I'm sorry if you thought your comment didn't go through. I had so much trouble with spam that I had to turn comment moderation on and so comments don't publish until I've looked them over. Sounds great! Thanks for joining, Christine! Great! Glad to have you, Virginie! Could I do... Storm Warning for The Stop Button? Sure thing! I'll add you later this evening. Yay! I'm glad Doris is back again this year. 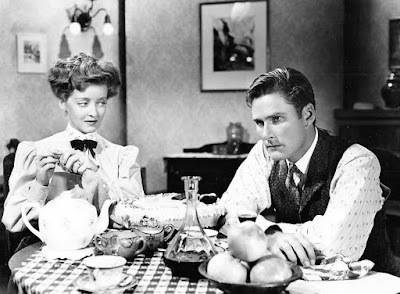 I'd love to do Tea for Two (1950), if it hasn't been snapped up yet. Would you have another topic in mind? It wouldn't be the same without you! Oops – I see that. I missed seeing it on the list in all my excitement. How about Send Me No Flowers (1964)? Hey There! Put me down for The Glass Bottom Boat! (Finally get a chance to do this one! Can I have Teacher's Pet (1958)? By the way, those banners are wonderful! Hey Michaela. Can I change my topic? I want to be different and write about something else other than a film. I think I will go with Doris and Rock Hudson's friendship. I'd love to do Pillow Talk since Crystal changed her topic! It was my mother's favourite movie. Wonderful! It's one of my very favorites as well. Hi Michaela, nice to finally be back doing a blogathon haha. I've been really busy and I'm super excited to do this one! Is it okay if I talk about Doris' music? I know people discuss her as an actress, but her singing voice is absolutely lovely. 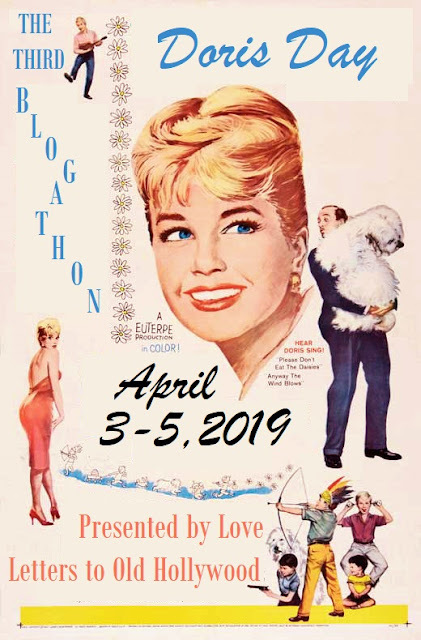 I'm so glad you can host this blogathon! She is one of my very favorites, especially as a singer. I need a day or two to think of a topic, perhaps related to her music? Sounds good! Excited to hear what you decide! Hi, can I join with a letter from Doris? I finally decided! 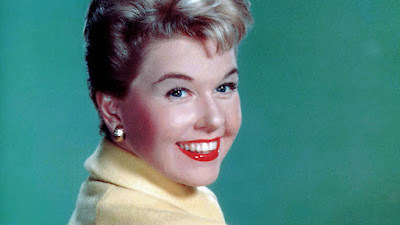 Could I write about Doris Day if she had played Annie Oakley? There is an album she made with Robert Goulet, recording the songs from that musical, too. Oh, that's an excellent topic! Let me preface this by saying I set myself up for failure on this one. 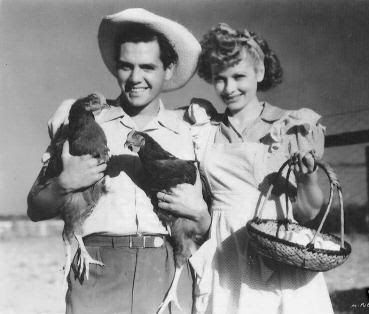 So much as been written about Lucille Ball and Desi Arnaz -- books, movies, TV specials, great blog posts. I can't possibly include all of the vast information I have at my fingertips, so if you're at all intrigued by my post, good news: there is a wealth of material out there. The Ball-Arnaz relationship was messy and sometimes hurtful, but it all came from two people who loved each other more than they could say. Their marriage brought them a legacy that transformed them into icons, yet they weren't the Ricardos -- they were Lucy and Desi, fallible people who ultimately couldn't stay together. "The most beautiful person we've ever had on the screen...He openly said he knew nothing about acting, and I admired his honesty because he was absolutely right." "Now Bette was a dynamic creature, the great big star of the lot, but not physically my type; dominating everybody around, and especially me, or trying to. This drove me off." As much as I wanted to be scholarly while writing this piece, I soon discovered that it was pretty hard to do, strictly on a personal level. You see, talking about Rock Hudson is something I love to do, but it can be difficult to leave his personal life out of the discussion. Because I adore Hudson, I'm apt to look at him as a tragic figure, a man who wasn't able to completely live as himself and died of a horrific disease. People often like to look at his films through the lens of his homosexuality, which is perfectly fine and a worthy thing to do, but it also seems to leave something out: Rock Hudson, the actor. Can we separate Rock from his closeted image and just examine him as an actor? I think I owe it to him to try. I can't believe that his sexuality is all that we have to define him. 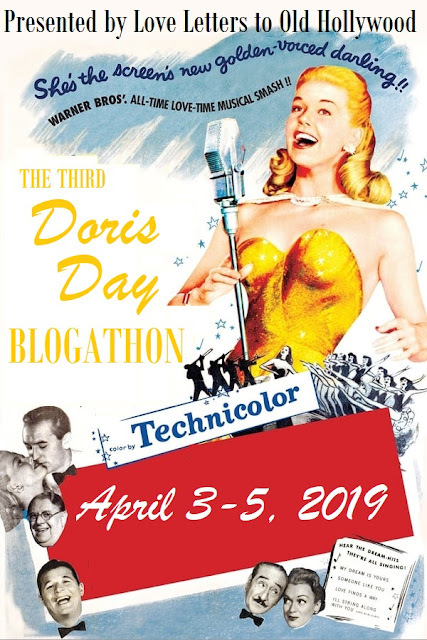 Announcing the Doris Day Blogathon! 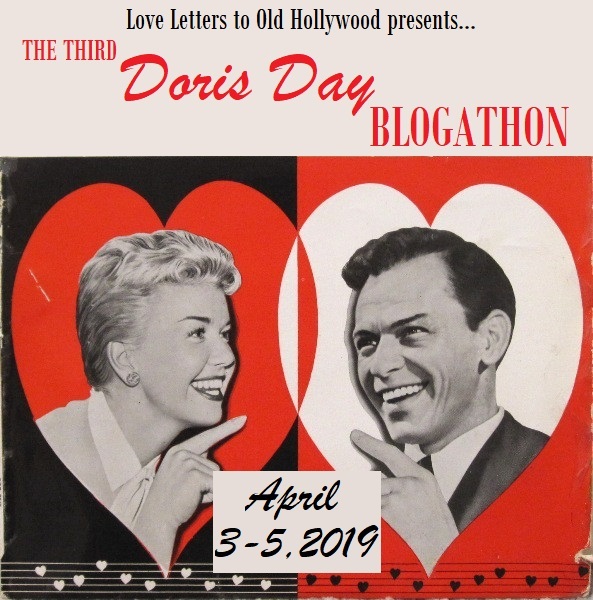 Doris Day has become one of the 20th century's greatest entertainers, so imagine my surprise that she hasn't been given her very own blogathon! Since Ms. Day is one of my absolute favorites, obviously that had to change, so I invite you to join me in celebrating the triple threat on April 1-3, 2017! I know, it's four months away, but that just gives you four months to prepare, right? (I also kind of wanted to make sure I announced this blogathon before anyone else could. It's happened before, so you can't call me paranoid. Just kidding, you totally can.) Although it's some time away, April 3rd is Doris's birthday... and she's still with us! Here are the rules: You can write about anything relating to Day -- her films, her music, her personal life, her work with animals, her role as a style icon, the list goes on! I also won't limit how many posts you want to do. Darling Simoa from Champagne for Lunch has nominated me for the One Lovely Blog Award! Thank you to Simoa for giving me my first one of these! And to my readers, please go check out her blog. It's pretty wonderful. The rules for this award are as follows: 1. Write a blog post accepting your nomination. 2. Show the blogger who nominated you how much you love them by thanking them in the post and linking to their blog. 3. Tell us seven things about yourself. 4. 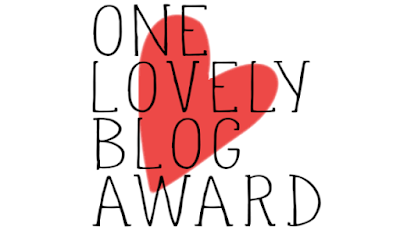 Nominate other blogs that you love. 5. Let the bloggers you’ve nominated know about they’ve received an award. 6. Post the rules again to let those bloggers know how it works. 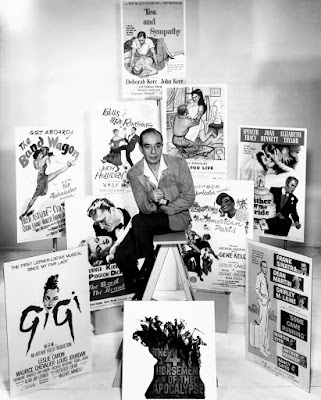 Announcing the Vincente Minnelli Blogathon! A genius filmmaker, Vincente Minnelli created some of cinema's most amazing images, as well as some of its greatest works: Meet Me in St. Louis, An American in Paris, The Bad and the Beautiful, Father of the Bride, The Band Wagon, the list goes on! So, in honor of Mr. Minnelli, I wanted to host my very first blogathon, which will be a tribute to the director and will take place on Dec. 16-18, 2016. Why these dates? Well, I originally thought of doing this on Minnelli's 114th birthday in February, but I decided I couldn't wait that long because I'm an impatient child. December was a touch closer and works with my current schedule, plus December 18th happens to be the 58th anniversary of the premiere of Some Came Running, so there's my official excuse. On to the rules! If you're a regular reader of my blog, you've probably noticed that a lot of my movie discoveries have come from my mom and my sister -- my mom will recommend something or mention someone I should check out, and then I wind up watching it with my sister (which can be good or bad). The same goes for my love of Jerry Lewis. 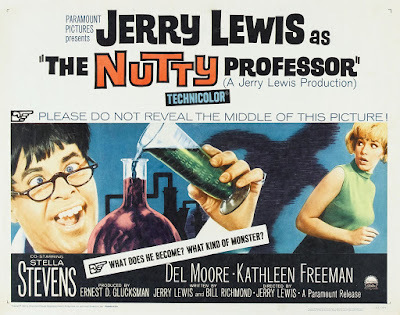 Besides always mixing him up with Jerry Lee Lewis, I never had an encounter with the guy or his work, especially since my main source of films is TCM and they don't show Lewis's movies nearly enough, maybe once every few years. Then came the magical day when my mom recorded a documentary, Method to the Madness of Jerry Lewis, a wonderful piece that I would recommend to everyone. My sister and I were transfixed, laughing hysterically at every film clip we saw. Announcing the 100 Years of Rita Hayworth Blogathon! On October 17, 1918, Margarita Carmen Cansino was born. 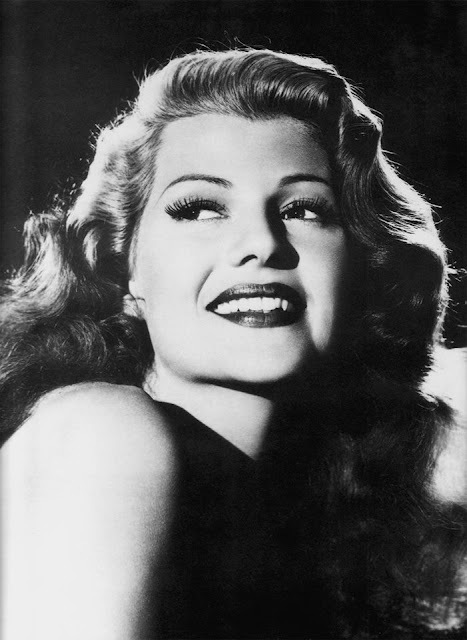 In the 1930s, she became Rita Hayworth, and over the next few decades, she was the iconic "Love Goddess." To this day, she remains a stunning talent and tragic figure for millions of film fans. For three days in October, I'll be celebrating this tremendous woman -- and just in time for her 100th birthday, too! I know it seems silly to announce this so early, but I'm going to be out of the country for two weeks soon, I'm about to start grad school, and I was afraid someone would beat me to the punch, so early announcement it was! You can write about anything relating to Hayworth -- her films, her personal life, her dancing, her Hispanic heritage, the list goes on! I also won't limit how many posts you want to do.